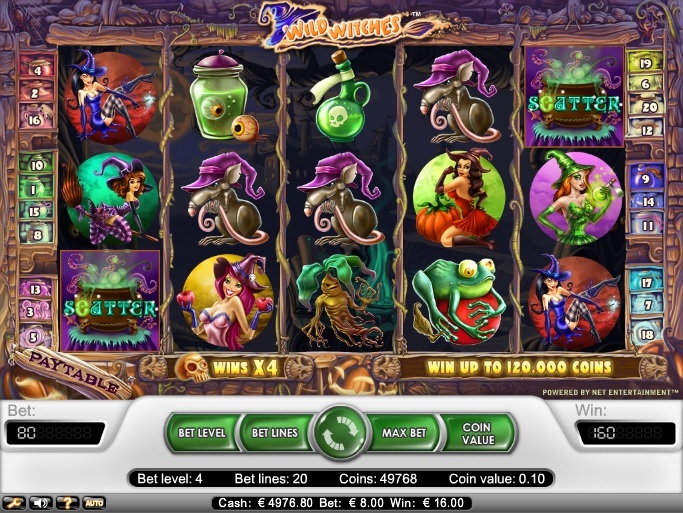 Wild Witches, a Net Entertainment (NetEnt) slot based on a witchy theme, challenges players to win a huge fixed jackpot of 10,000 coins in addition to scatter and free spin wins. While players can win up to x200 in scatter payouts, all free spins wins get tripled. In addition, there are two wild multipliers, which multiply payouts by up to 4. Wild Witches is a non-progressive online video slot with 20 paylines. Players can bet up to 4 coins on every line they activate and choose from a coin value range of $0.01 to $1.00. This means that players can bet anywhere in the range of $0.01 to $80.00 per spin of the reels. The next step is to spin the reels, hit a winning combination, and collect the payouts. If players get tired of spinning the reels manually, they can use the slot’s Autoplay Feature to set the game to spin on its own and collect payouts for them. If players want to interact with some witches, learn how to cast spells, and win big money, they must spin the reels of this witch-themed slot. Set against a dark backdrop, the reels feature icons of several witches, frogs, mandrake roots, rats, jars of eyeballs, and vials of poison. The slot features amazing graphics and audio effects and delivers several hours of entertainment and big prizes. The Spellbook icon is not only the wild, but also the multiplier. If players use the Spellbook wild to create a winning combination, their payout for that combination gets doubled. If players land a combination of 5 Spellbook icons along an active payline, they will win the top fixed jackpot of 10,000 coins. If they manage to spin only 4 Spellbook wilds along an active line, they will win the second biggest jackpot of 2,500 coins. Since the Cauldron is the scatter icon, players do not have to spin combinations of Cauldrons along an active payline to win payouts. If players spin 2, 3, 4, or 5 scatter icons anywhere on the reels, they will win scatter payouts of x2, x5, x25, or x500 their bet amounts. If players land 3, 4, or 5 scatter Cauldron icons anywhere on the reels, they will win 10, 20, or 30 free games, respectively. Any prizes won during a free game will be tripled. In addition, players can re-activate this feature while playing a free game. Wild Witches slot has another wild icon in the form of the Witchy Wild icon. It appears only on the third reel, but multiplies all payouts it helps players to create by four. Wild Witches is one of the most exciting slots in the NetEnt portfolio as it has not only a delightful theme, but also generous jackpots and several bonus features.